Shipping news? Forget it. With the constant nautical comings and goings here the shipping news would be non-stop. We’re sitting on the roof terrace of our hotel. It is a beautiful clear evening with the sun low in the west. Ships are constantly passing – the big ones dropping harbour pilots off just in front of us. We’ve been successful in our quest for bicycle packing material. Cartons this morning and packing tape this afternoon – despite early difficulties. 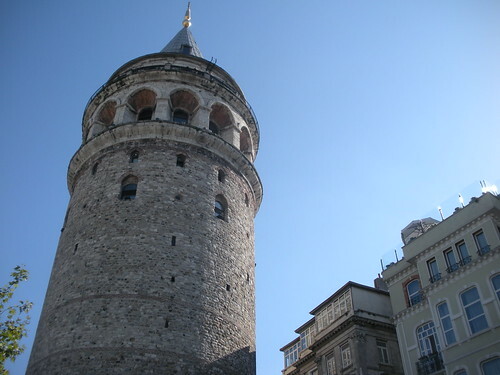 This afternoon, after visiting the Galata Tower on the northern shore of the Golden Horn, we walked back through narrow, winding lanes between beetling, commercial buildings – first electronic shops, then music shops, then electrical, then (by the waterfront) ship chandlers. (Vendors cluster by type in this city.) We spied a man packing some cartons in one of the electrical shops and Rosalie sallied in to find out where she might get some of the packing tape he was using. She came out with that roll (he wouldn’t take her money). One hundred metres further on a barrow trader had packing tape amongst his wares so we augmented our newly-acquired scrag-end with a whole roll. Fifty metres further on there was a tape specialist shop. So anybody struggling to find packing tape, duct tape, reinforcement tape, etc in Istanbul just proceed immediately to to N41° 01′ 23.2″ E28° 58′ 17.6″. As we walked along the Bosphorus shore to the centrum at lunchtime we passed a number of masonry windbrakes built on the artificial rocky foreshore. Some were occupied by fishermen others by swimmers or sunbathers – all middle-aged men. There was a very strong current rushing towards the Marmara so the swimmers were rushed south and must have had a long walk back to their clothes when they climbed out. All we need to do now is to work out now is how to get to the airport in time. We think the shuttle bus is too late and may not carry our bikes. For a rest during the afternoon we took a ferry ride across the Bosphorus to Asia and back, including a spot of fare evasion as we stayed on the ferry, eventually mingling with boarding passengers for the return journey. The crime was unintentional (initially). We were puzzled by several strange contraptions we saw in the street this morning. They looked like donkey pack-saddles but then we saw some old men sitting on them and thought they were simply portable seats. Late in the day we saw similar man carrying large cartons on them slung over their shoulders. So, we were almost correct first time: pack saddles but for unfortunate old men rather than donkeys. I should have got one of them to carry the bike boxes back to the hotel. By doing it myself I did them out of a job. We are continually impressed by the willingness of drivers of vehicles of all sizes to attempt streets of any width or grade. Below the Galata tower we saw a small truck trying to reverse up a narrow street that had blocked by a haphazardly parked car. The street was so steep that the truck was losing traction on its back wheels. A man was bouncing on the tailgate to add intermittent traction. We observed briefly from a vantage point *above* the truck. 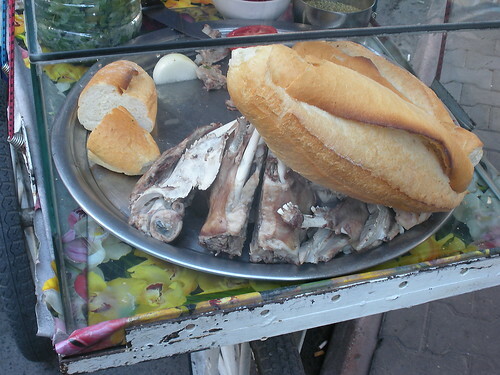 Just before we crossed back across the Golden Horn we saw a small food stall selling sheeps’ heads with bread rolls. One portion was one side of a sheep’s head which guaranteed the lucky buyer one eye, a fleshy cheek, half a brain, half a skull and age-appropriate hemi-dentition (sheep’s age and dentition that is). We resisted the temptation. 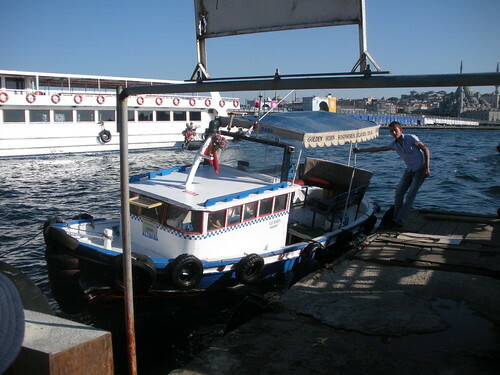 We accepted a lift back across the Golden Horn from an informal water taxi – small, with a killer exhaust and bobbed like a cork in the lumpy waters of that busy waterway. We followed the traditional advice of not paying the ferryman until we reached the other side. This entry was posted on 15 September 2010 at 3:50 pm and is filed under Turkey. You can follow any responses to this entry through the RSS 2.0 feed. You can leave a response, or trackback from your own site.